Accidentally came across this mp3 converter site, and now I see it’s riding the wave of extreme popularity and high traffic right now. Judging by the public stats, it tripled or quadrupled its visitor traffic just this summer. Well, SEO is a mysterious beast, you never know what and how someone somewhere puts a link, and it changes everything… Well, good for TheYouMp3, for sure. Maybe all these sites I’m reviewing eventually start linking to my reviews, and then savetube will be overwhelmed with traffic..Like back in 2013, when my offliberty.com review was the only piece of writing/blogging about that site, and at some point my review was being served in google’s search result pages on 1st place, even beating the obvious 1st result offliberty.com.. That was a week of mad traffic.. 10-15k visitors daily.. I was on the 7th heaven.. Until it changed back to normal..
Well, less about me and my dreams, right? And lets get back to TheYouMp3.com Review. We will start with the video. Today I selected new Katy Perry’s song – Swish Swish. I was truly surprised and kinda even liked it.. What? No, not the dancers, – the beat. It’s pretty cool, it’s made in best traditions of classic house music. So let’s try to extract that video’s mp3 aka youtube to mp3. This is what the site is supposed to do, judging by its name. In this article I’m not going to make it look like step-by-step tutorial, since the site itself has that 3-step tutorial right there on front page. Just check out the first screenshot below, it has a red arrow pointing to the box where you should insert the video URL. Below that box there’s a little red button which allows one to crop the audio and only take 2-3 minutes from the middle, for example. It is also a nice option for those looking to make a ringtone from the youtube video. Simply cut out the length you want, and download it directly to your smartphone. Also please note to the right of the box there’s a drop-down which now says MP3. if you check its contents, you can see that this site TheYouMp3.com actually allows to download video from youtube and many other sites. I guess initially they started as youtube to mp3 converter only, and later introduced more options. And so we paste the video URL into the box and press CONVERT button next to it. The image below shows what we see – next page which offers us either download the mp3 or save it to our dropbox. Nice feature. Then there’s convert another video button. That’s all there is to this website, to be honest. Don’t forget, you can also download the video using TheYouMp3, for that simply pick the VIDEO option to the left of CONVERT button on the site’s front page. Download happens pretty fast. Why do I mention download speed here, i usually never care. Well, in this case download actually happens from theyoump3’s website. Yes, instead of doing the normal redirect from youtube, to maximize our download speed, cause none other website has as much bandwidth as youtube, they actually first download video to their site, and then send it to you from their site. This is not really a good way to do video download from youtube. Plus you can get in trouble, cause there is an indication that your website downloads the video, so it may actually store it, and that is completely against youtube and other sites’ TOS and stuff… While it’s hard for them to disallow and prohibit downloads completely, for every end user it’s ok to download the video and keep it for themselves, never share anywhere. Kinda OK. there are no strict rules or regulations in this area yet.. But for a website to somehow indicate that videos actually go through it – no, that is not a good idea.. can get sued eventually..
Well, first of all, downloaded audio is 192kbps. It’s as close to original as it can be. And original is a maximum of 140kbps, usually only 128kbps. People, remember, it’s impossible to get audio much better than 128kbps now from youtube. 5-10 years ago maybe yes, 720p video version had 192kbps audio, and 1080p could have 256kbps audio. Not anymore..
Second, TheYouMP3.com doesn’t work with playlist, it only does 1st video from the playlist and doesn’t indicate if there are more. So please, do not expect..
Third, and most important in my opinion, – adss.. Overwhelmed with ads. There’s even a slide out ad on the right bottom of the page.. Accidentally my mouse was there when it came out, and thanks to that it started playing sound. I hate ads that play video and especially sound… Even static ad with automatic sound almost always ensures me never coming back to this site. And again, since it was originally just a video to mp3 converter, it actually only allows for a maximum of 720p video download. 1080p is not visible, not offered and not available. Interesting fact.. Usually 1080p downloads are not offered due to either trying to get money for some software that’ll do it or simply not wanting to do it, because it requires either you or server to put audio and video tracks back together, mux them. So since other sites just let you get video directly from youtube, it is not possible for them to mess with the video, right? But this site actually downloads video.. So it would be really an obvious move to join 1080p soundless video with the sound track, while download is happening, on the fly, and redirect that to the user.. But no.. Not yet..
TheYouMp3.com gets 4 stars from the editor. It’s a nice little site without too many options, and does a quick deal of converting mp3 without too much extra data and pretty fast. Video downloads are not so great, since they go through this website. Recently all sites reviewed here on savetube were smart enough to simply redirect users’ downloads from youtube right into their browsers, avoiding slowdowns with 3 point transfers with the middleman involved. For mp3 downloads – yes, most videos need to have their audio downloaded and converted. While video can be redirected and substituted to be downloaded directly from youtube. Generally it’s OK to use TheYouMp3, it looks quite safe and welcoming..
Not sure if your review is still current. 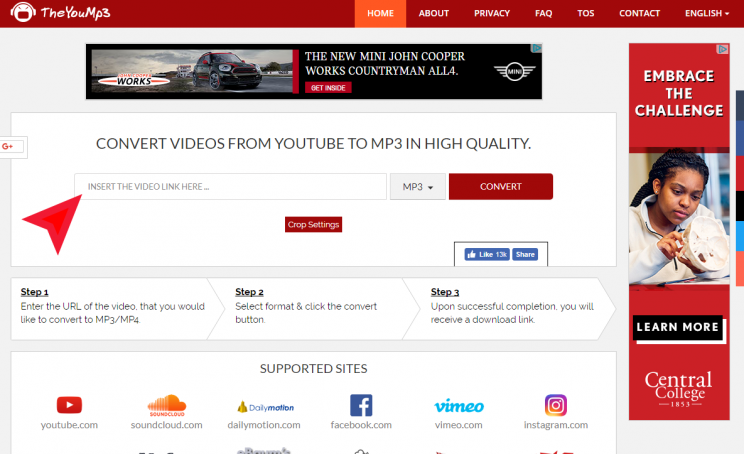 Took a look at this site theyoump3.com and it seems that on conversion of any video, there is now a redirect for download of an extension before the upload of the mp3 is allowed. I may be my error, however I am not a fan of sites that load unsolicited extensions to my system, and I think that my belief is widely held. thank you much for reporting this! you maybe mistaking though, i just tried 4 random youtube links and all of them say “We cannot process this video right now”. so there are 2 speculations from that result. 1 – sysops are fixing the error, which could have been a temporary hacker exploit overtake or whatever. and 2 – maybe they saw that extension is losing them visitors, so they are switching it back to normal download..
i will be on this case checking, thanks! !